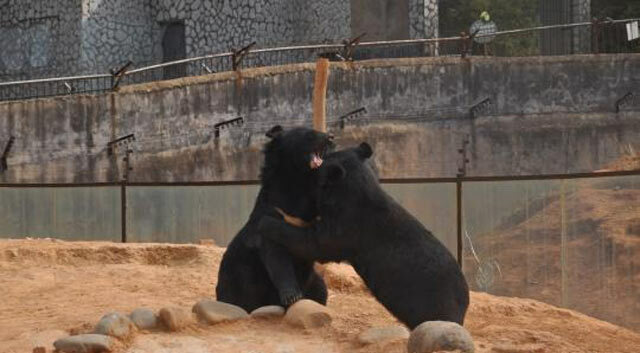 Two Asian black bears mistakenly thought to be “pet dogs” by a local villager for two years in Yunnan Province have been sent to the provincial wildlife rescue center. While the bear were cubs, Wang said they were very lively, friendly with people and “fun to be around.” But as they grew, they started to behave weirdly: catching and killing the occasional chicken and climbing trees. Wang finally realized that his “pet dogs” were actually bears when he accidently saw a poster showing bears like his put out by a wildlife protection agency. Wang alerted local officials and the bears — an endangered breed — were sent to the rescue center. The two bears are reportedly in good condition.